Inspired by the pioneering work done in the fields of industry,instrument and pharmaceutical, by my grandfather and his brother the late Sri Ayyagari Ramamurti and Dr A.N. Rao eighty years ago and encouraged and supported by my father Sri A.S.Chakravarthy with his fifty years of experience in pharmaceutical business and industry, I have taken up the responsibility of putting Regardia Pharmaceuticals, founded by my father, on a firm footing and in an expansive mode. Sri A.Ramamurti founded the Andhra Scientific company at Masulipatam in 1927 and his brother Dr A.N.Rao the Eastern Drug House, a pharmaceutical industry, also in Masulipatam and both of them pioneered the industries, the first of their kind to be set up in South India. 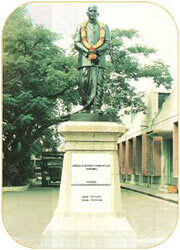 Dr Sarvepalli Radhakrishnan India’s Vice President then, unveiled my grandfather’s statue on January 3,1953. The goodwill I have among doctors.